Laramie. considered by many to be one of the best family westerns of all time. debuted on NBC on September 15th. 1959. Long sought after by collectors and fans. TMG and NBC are proud to present the complete. authorized Season One of this great television series. 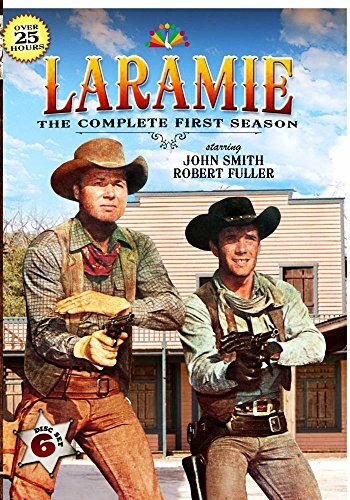 Starring John Smith (Cimarron City) as Slim Sherman and Robert Fuller (Wagon Train. Emergency) as Jess Harper. the fine cast also included songwriting great Hoagy Carmichael (Stardust. Ole Buttermilk Sky) as Jonesy and Robert Crawford. Jr. as Andy Sherman. Each weekly episode brought Hollywood guest stars to the show. including Eddie Albert and Nanette Fabray (Glory Road). James Coburn (The Iron Captain). Gena Rowlands (The Run to Tucumvaca). Brian Keith (The General Must Die). Charles Bronson and Richard Farnsworth (Street of Hate). and Ben Johnson (The Hour After Dawn). 31 Exciting Episodes!When sold by Amazon.com, this product is manufactured on demand using DVD-R recordable media. Amazon.com's standard return policy will apply.